Light is also an issue in my kitchen, I needed a brighter/lighter look. We plan on updating our countertops, backsplash and kitchen sink, but I wanted to make color/style decisions slowly as I finished each phase, instead of deciding all up front. 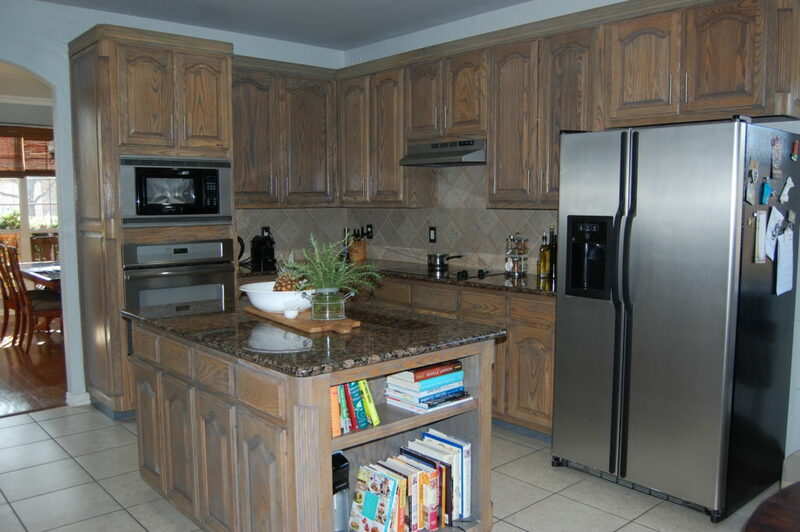 Originally, my kitchen had black appliances except for the refrigerator, which is stainless steel with a small amount of black trim. When my dishwasher and oven died last year, I replaced it with stainless. 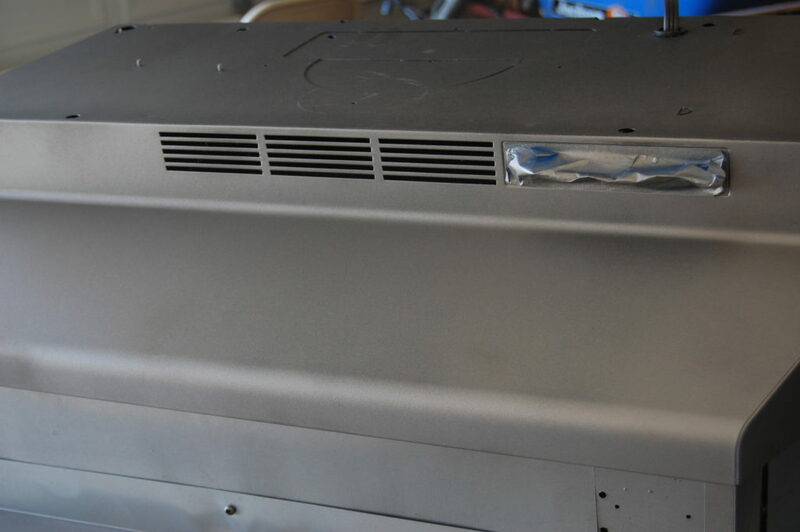 The only thing left black was the oven hood and micorwave. 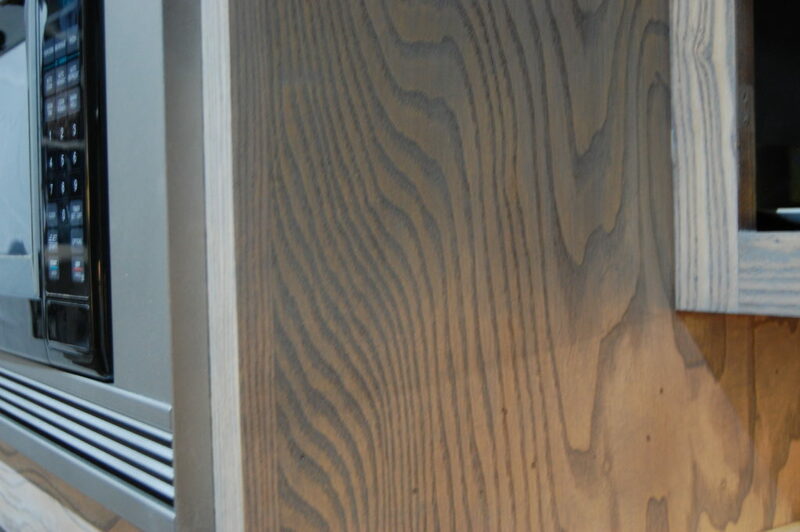 For the cabinets, I would strip and sand all of the original color off down to the raw oak wood. 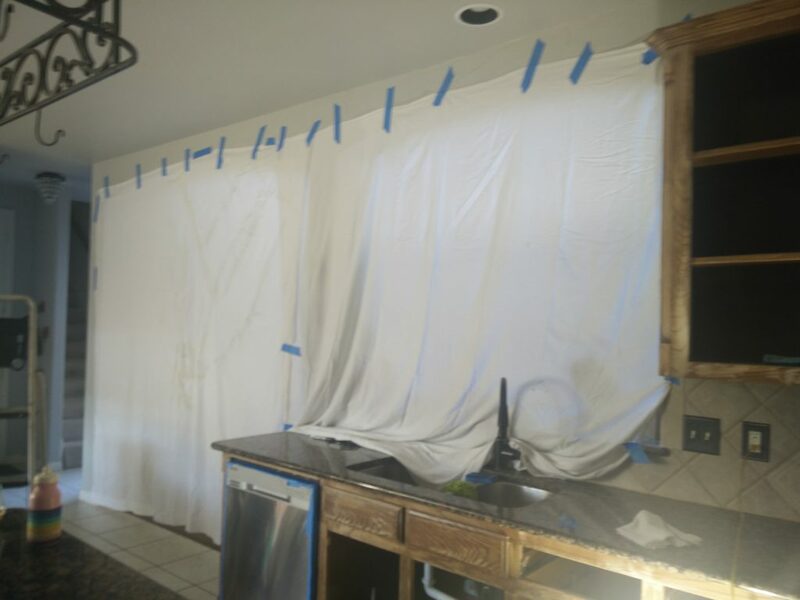 This would mean a fairly big mess inside my home, so I started this project by moving out of my kitchen. 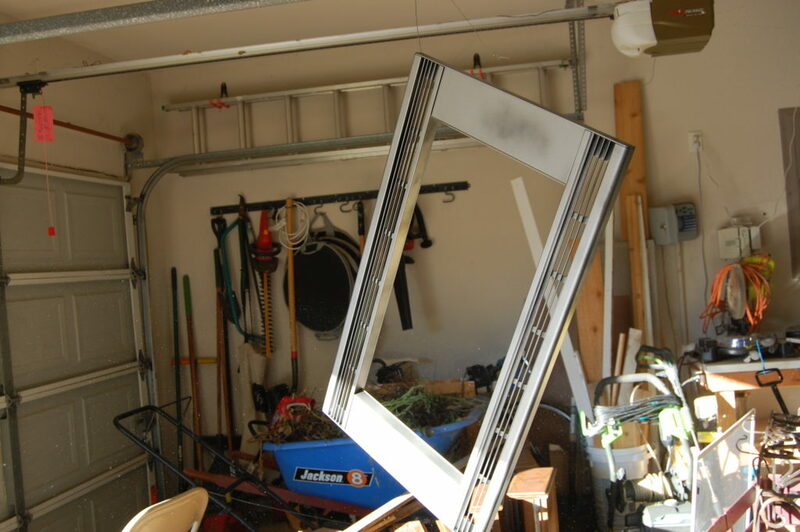 I stored everything in my dining room during this phase, which is next to the kitchen. It was pretty easy to still operate and make the family meals around the mess. 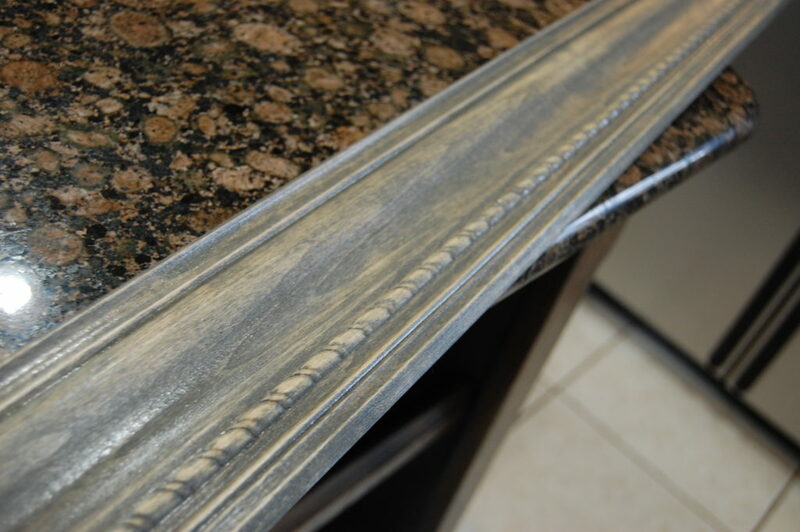 Focus on the base of your cabinets first because you will want to get through the inside messy stage ASAP (the doors/drawers can be done outside/garage). 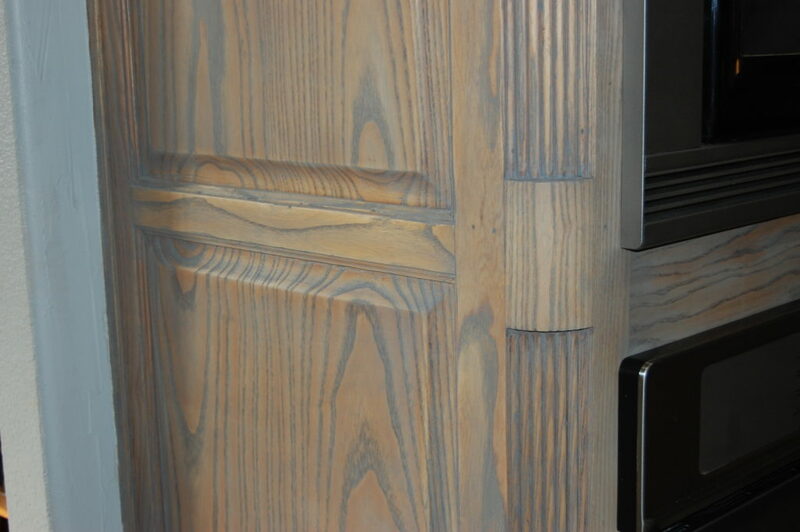 I experimented with several different grey stains, but most of them were too dark, until I tried Minwax Classic Grey #271. 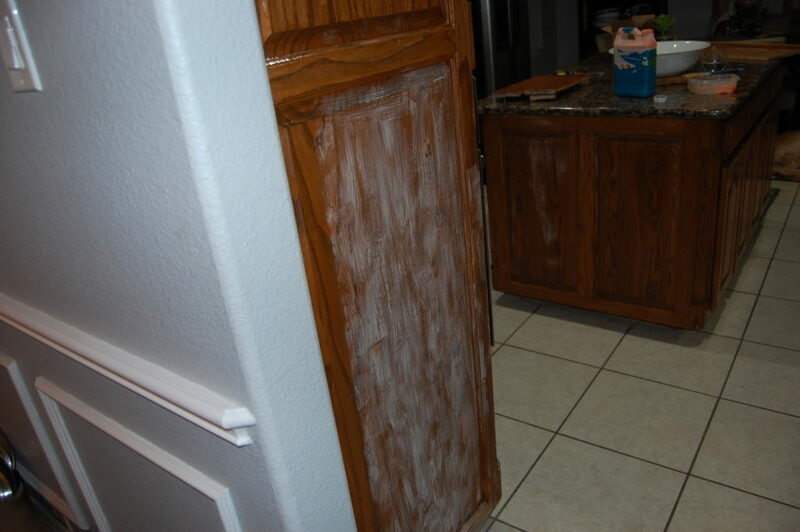 If you are going for a ligher look, a stain/polyurathane one step product will not work, they are way too dark. 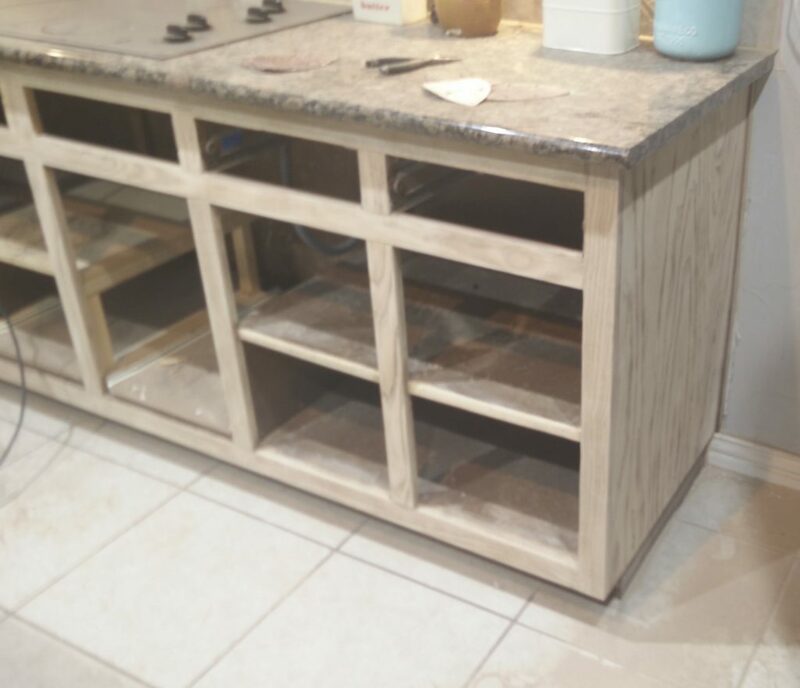 I noticed that the stain did vary in how the wood absorbed it, so I held off applying the polyurathane top coat until I got the doors / cabinets finished and put back on. 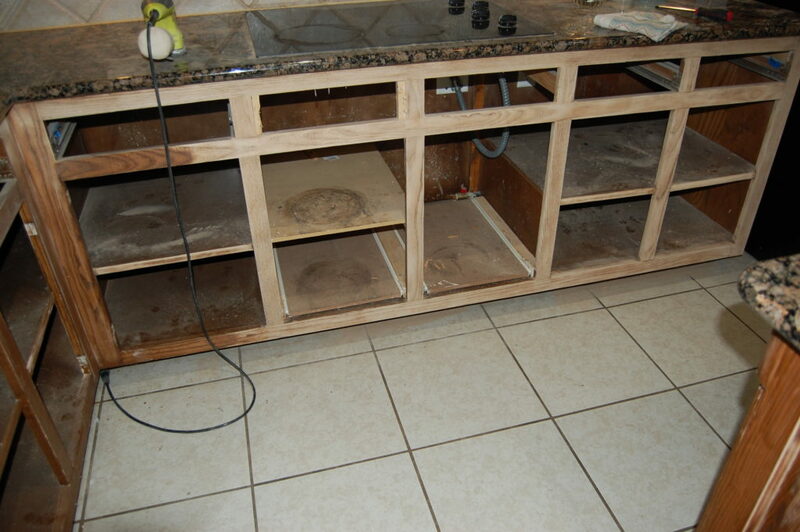 I wanted to make sure I could add stain or sand off some of the stain if areas were too dark. 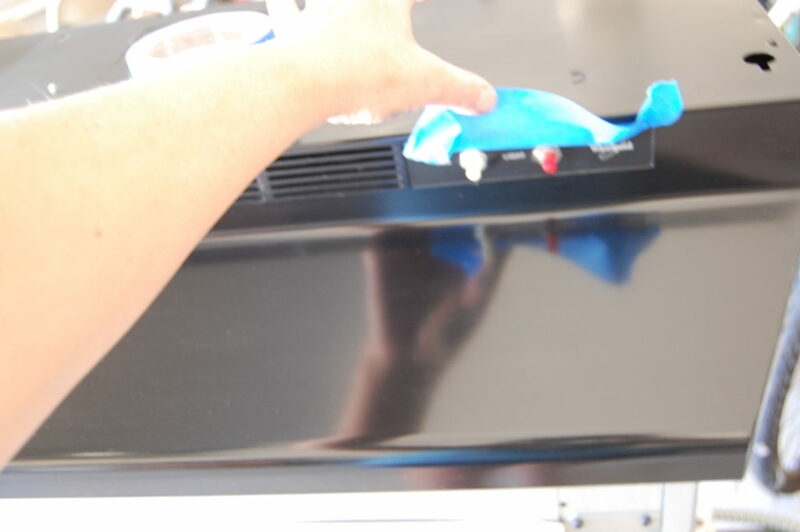 Instead of spending money on a new microwave and range hood , I thought I would try spraying them with stainless steel spray paint. This paint is amazing! But be careful to spray evenly with no drips. I found that if you hang the item, it’s much easier to achieve a smooth finish with no drips instead of laying on the ground and turning over once dried for the other side. Make sure to tape off any knobs or labelling. 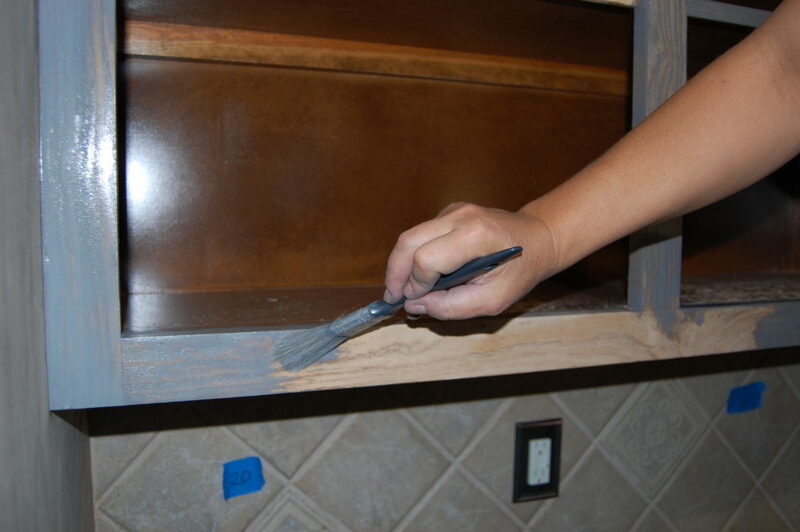 After the mess of “inside the house” sanding is done, consider your cabinet interiors. Notice the freshly painted range hood, you really can’t tell it was painted. 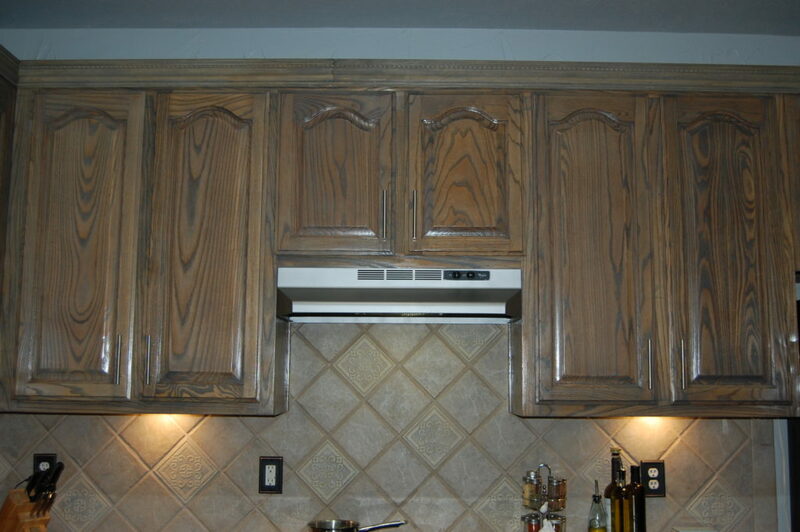 My original trim was attached at an angle, which made the kitchen look smaller and more dated. 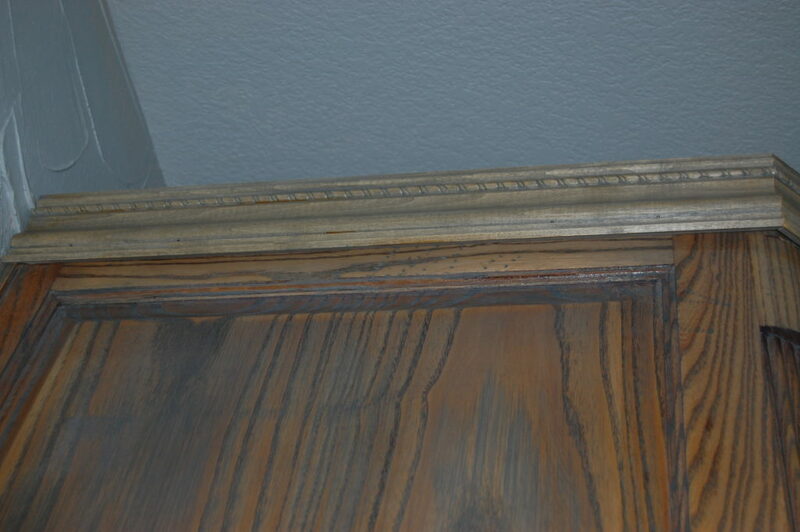 I am replacing it with wider trim that will be attached with small nails and straight up and down instead of an angle/crown molding look like before. 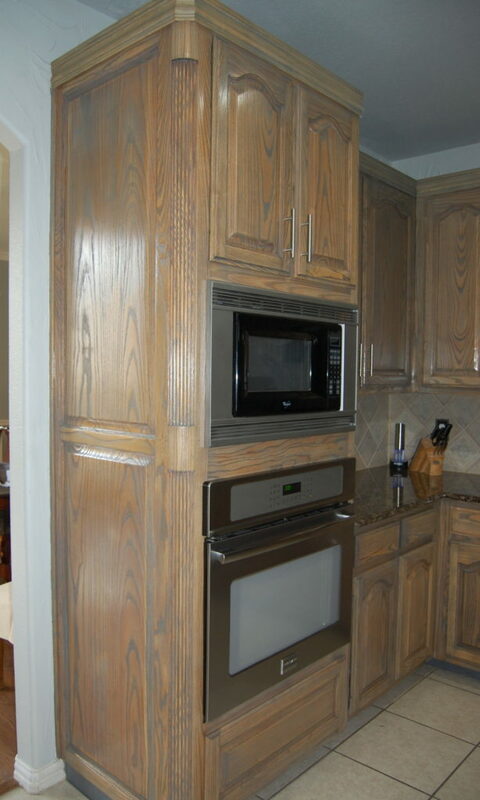 One small issue that I ran into was that the trim, after staining with the grey did not have the same look as the cabinets…the trim wasn’t oak, so I had to add some oak stain to achieve the same hue. 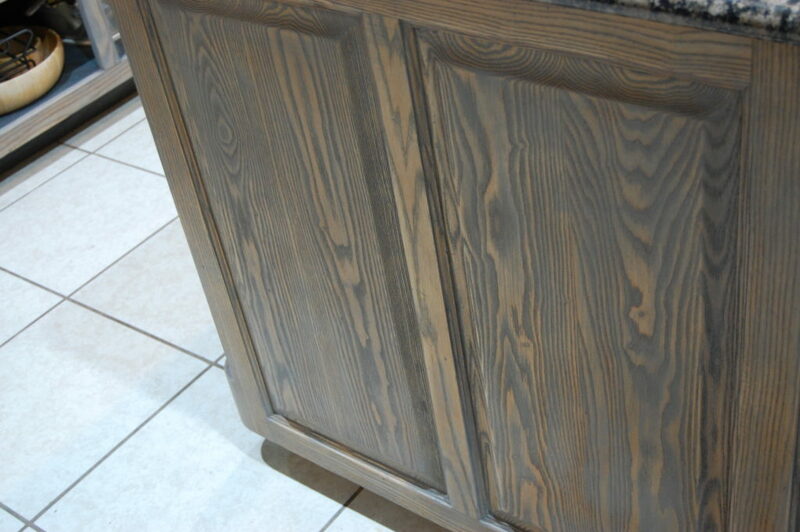 The end look is slightly darker than I planned but very rich and warm and I think the cabinets will look great with light countertops and white backsplash…our future project. 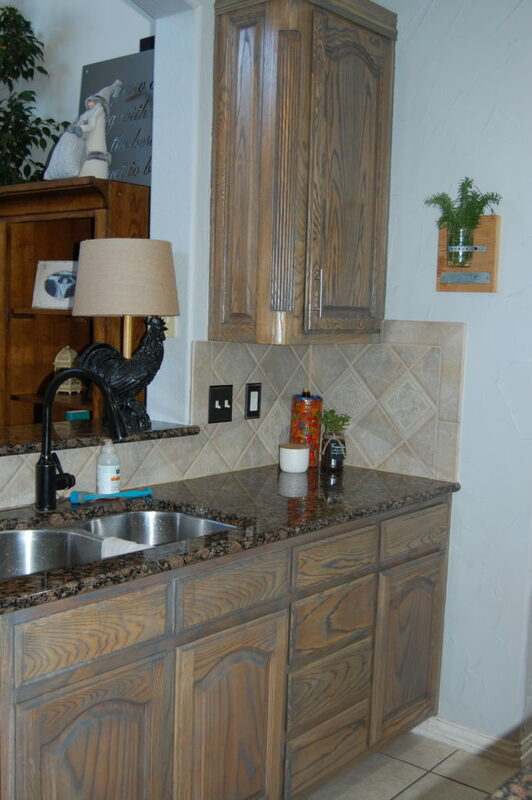 Next steps include new lighting over cabinets and island, and new sink. When I need to replace the microwave and fridge, I will go with all stainless but for now, I think they are fine. In the end, this was a whole lot of work, but I really love how they turned out. 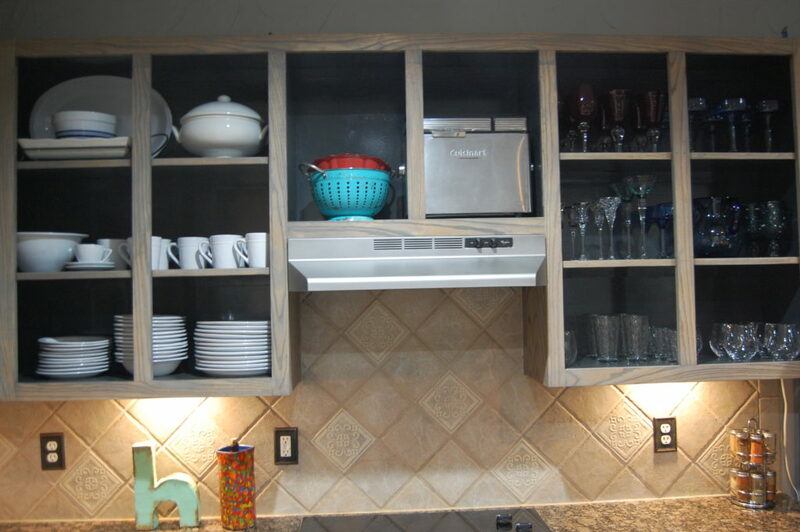 I love your project…gave the cabinets such an updated look..only one thing I would change…the plates for the wall outlets. 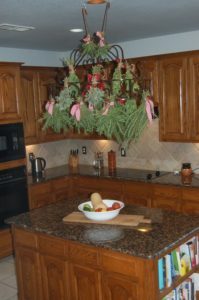 Maybe spray them a color that blends with the backsplash.. Thanks Cindy! 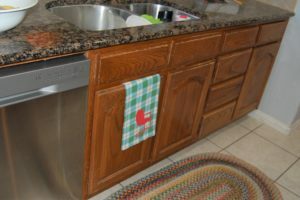 I agree with you on the plates…they will get replaced when I do the new backsplash. Wow! What a transformation I would really, really like to do that in my kitchen. Personally, I do not think it is too dark. You did an awesome job! Thank you for photographing each stage of your project and sharing it with us. This is inspirational! 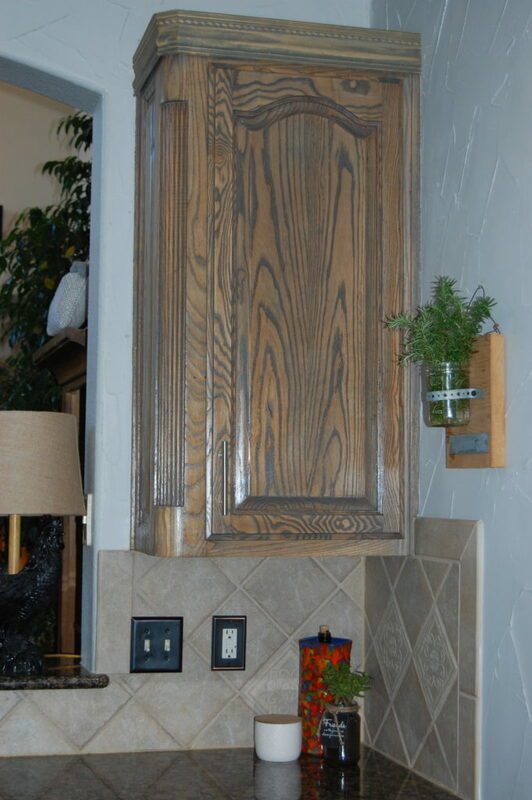 I think about lightning my natural oak cabinets and your post has given me another option to think about. Amazing! You said it….a lot of work, but beautiful!